All colors lie within a specific region of Munsell color space called the “Munsell color solid.” Hue is limited to one turn around the circle. The scale of value is limited on the lower end by pure black, which is as dark as a color can be, and on the top by pure white, which is as light as a color can be. For a given value, there is a limit to the chroma that is possible, even with theoretically ideal coloring agents. Real coloring agents, with less than ideal characteristics, impose further limitations on physical representations of the color solid. 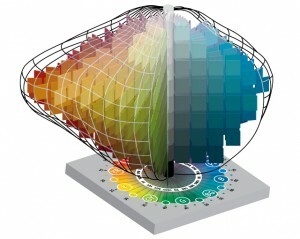 The Munsell Color Order System itself is applicable to all possible colors. The highest chroma yellow colors have rather high values, while the highest chroma blue colors have lower values. Now that you have learned about the Munsell color solid, you can now learn how to read a Munsell color chart.